BIG-IQ enables administrators to centrally manage BIG-IP infrastructure across the IT landscape. 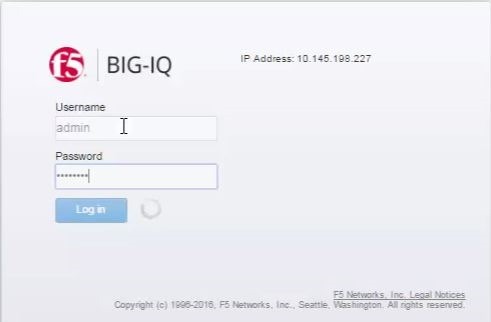 BIG-IQ discovers, tracks, manages, and monitors physical and virtual BIG-IP devices – in the cloud, on premise, or co-located at your preferred datacenter. Let’s look at how to get BIG-IQ 5.1 to gather the information needed to start managing a BIG-IP device. This gathering process is called Device Discovery. Once in, the first thing you do is let the BIG-IQ know about the BIG-IP device that you want to manage. 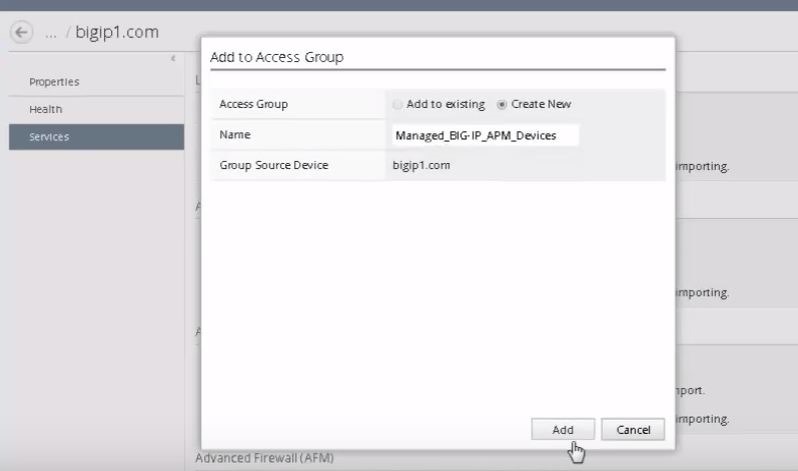 Here, in Device Management>Inventory>BIG-IP Devices, we’ll click Add Device. Here we’ll need the IP address, user name and password of the device you want to manage. 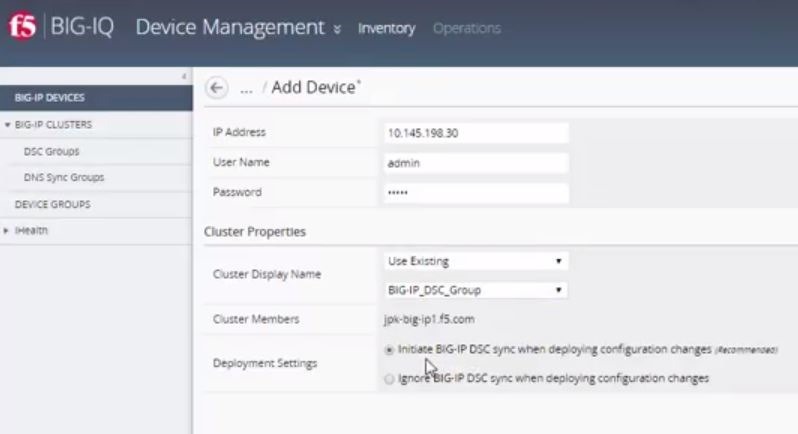 If the device you want to manage is part of a BIG-IP Device Service Cluster (DSC), you’ll probably want to manage that part of its configuration by adding it to a DSC group on the BIG-IQ. After selecting a DSC, tell the BIG-IQ how to handle synchronization when you deploy configuration changes so that when you deploy changes to one device, the other DSC members get the same changes. Best practice is to let BIG-IQ do the sync. Next click Add at the bottom of the page to start the discovery process. Once the device recognizes your credentials, it’ll prompt you to choose the services that you want to manage. You always select LTM, even if you only mange other services because the other services depend on LTM. To finish the device discovery task, click Discover. The BIG-IQ gathers the information it needs for each of the services you requested. This first step takes only a few moments while the BIG-IQ discovers your devices. You are done with discovery once the status update reads, Complete import tasks. Now, we need to import the service configurations that the BIG-IQ needs before we can start managing that BIG-IP device. Click the link that says, Complete import tasks. Next, you’ll begin the process of importing the BIG-IP LTM services for this device. Just like the discovery task, you’ll import LTM first. This could take a little time depending on how many LTM objects are defined on this BIG-IP device. When the import finishes, BIG-IQ will display the date and time of when the operation was completed. Now, we repeat the process for the second service provisioned on this device. Importing an access device like BIG-IP APM is slightly different. Part of the import task is to identify the Access Group that this device uses to share its configuration. Whether you’re adding to an existing or creating a new access group, when you’re done entering the name of the group, click Add to start the import process. Here again, the time to process depends on how many BIG-IP APM configuration objects are defined on the device. When the BIG-IP APM services import finishes and the time completed displays, you can simply click Close to complete the task. 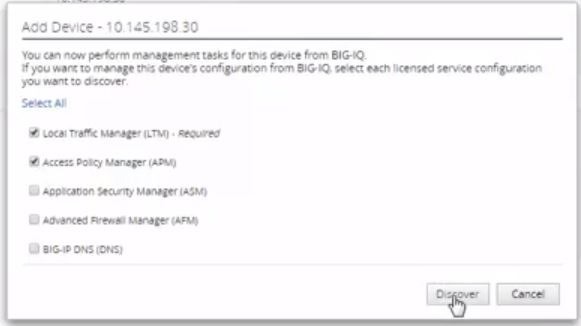 You can now see that the device has been added to BIG-IQ. That’s it! Now you can start managing the BIG-IP LTM and APM objects on this device. For this article, we only imported LTM and APM objects but the process is the same for all BIG-IP services you manage. Thanks to our TechPubs group and watch the video demo here.